Where Quality Always Comes First! No Matter How Big or Small! N.W. Metal Fabricators, Inc. has proudly provided fabrication, welding and machining services to customers throughout Hermiston, OR since 1986. Our customers know they can count on us to ensure products that are handcrafted to meet exact specifications. Contact us today for a free estimate on your project. For metal fabrication, machining and custom welding in Umatilla County, OR, N.W. Metal Fabricators, Inc. is your premier choice. We’re a full-service fabrication shop with years of experience and a dedication to complete customer satisfaction. As a result, we’re well-known for providing our customers with finished products that are made to an unparalleled level, done to spec and created within budget. Whether you need shearing and bending for a simple project or your design demands custom welds and powder coating, you can have confidence in asking us to tackle the job. 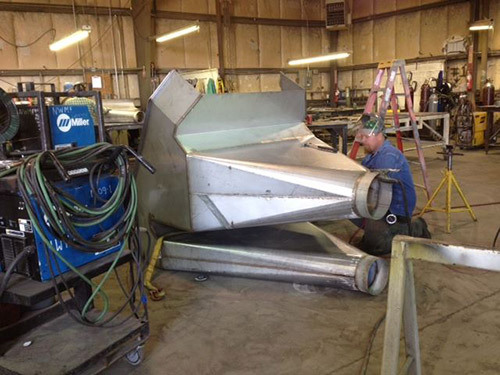 Our success as a welding and fabrication shop in Umatilla County, OR comes from years of hands-on experience. We have more than 100 years of tenure in the food-processing industry and specialize in the custom production of storage bins, conveyors, catwalks, handrails, gates, storage tanks, water heater tanks, sanitary piping, and steam piping. Beyond this unique industry, we also serve individual customers with unique demands. From gates to platforms, equipment repairs to water jetting and beyond, we’re happy to explore your unique fabrication project. We even stock a tremendous assortment of stainless and mild steel, to cut down on costs and turnaround times for individual jobs! We invite you to contact us today to learn more about how we can help bring your vision to life with metal fabrication. We have more than 100 years of professional fabrication experience. We’re members of the American Society of Mechanical Engineers. Our shop is widely accredited, with Certified Welders in up to 15 special materials/applications, certified crane operators and more. We’re also Transportation Worker Identification Credential (TWIC) and Occupational Safety and Health Administration (OSHA) certified. We provide all of our customers with a free estimate on their project. For specialty welding, custom fabrication and a wide range of machining services, contact the professionals at N.W. Metal Fabricators, Inc. today!